ImageType | Sets the correct file extensions to photo files in batch. Sets the correct file extensions to photo files in batch. ImageType sets the correct file extensions to photo files in batch. ImageType adds or appends file extensions (png, jpeg, etc.) to image files with missing or inappropriate extensions. • Supports the file types for which QuickTime exporters are installed. • If a file has an extension, but requires an updated extension to match the file type, it will be appended, and the original will not be replaced. • A file may appear that it has no extension, when in fact it does. It could be that the extension is hidden. 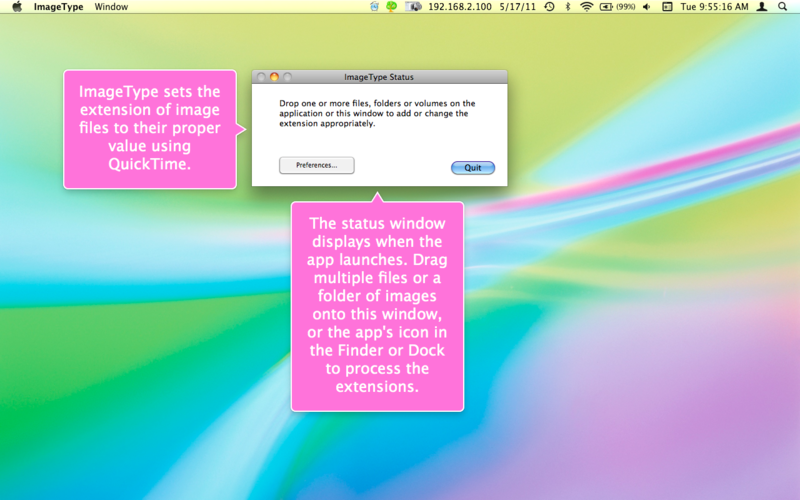 To verify this select the file in the Finder, then select "Get Info" from the File menu. Check to see if the "Hide extension" checkbox is selected.